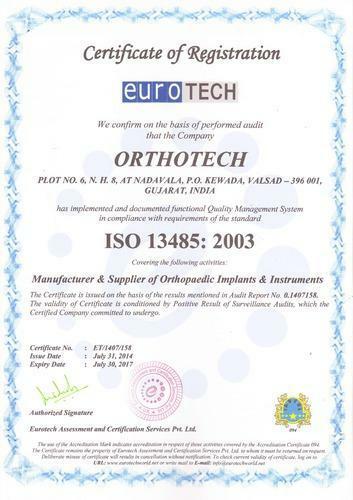 We strictly follow ISO norms and international quality standards in the manufacturing of our orthopedic implants and instruments. Our quality auditors make sure that only qualitative raw material is used for production process and diligently check entire production process. We also conduct advance tests to verify the finish standards of the manufactured implants. 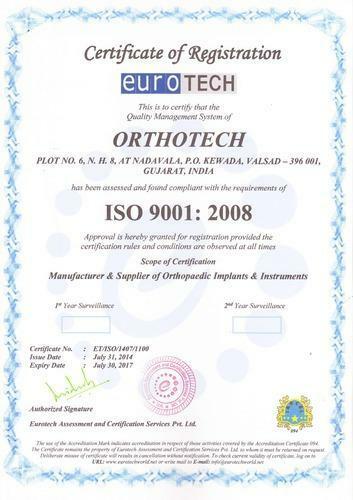 It is our constant commitment to offer international quality range of orthopaedic implants and instruments. Our Quality Assurance process starts from the procurement of raw materials to the final packing of the products and at every stage of manufacturing process, we have stringent quality checks to ensure the dimensional accuracy.